January is a month closer. 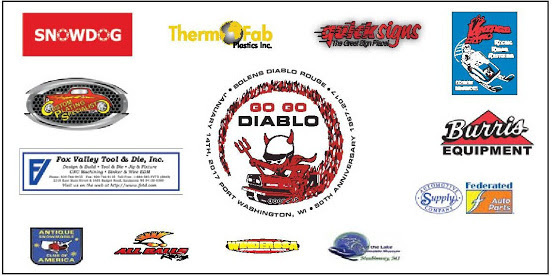 Planning for the Bolens Diablo Rouge 50th Anniversary Celebration continues to be strong.Sponsorship has been excellent. A number of businesses are stepping up with donations both to cover costs and supply door prizes. Other sponsors are providing advertising so we can get the word out to people all over the US and Canada. If your business is interested in supporting, we would be very grateful and eager to add your company logo to the banner. Most of the efforts right now are preparing for the banquet. We are planning a night of fun, entertainment, acknowledgement and door prizes. Some of the bigger prizes are a Stihl Trimmer or Blower from Burris Equipment, a number of Gift Certificates and a full Diablo Cover Set. There will be many other smaller prizes like apparel, signs, Diablo & Hus Ski Parts and even Maple Syrup. Wow – we are hoping everyone goes home with something. Start thinking about the memorabilia you have. We would like to set up an area in the banquet hall showing all sorts of Hus Ski and Bolens Memorabilia. With luck, the Port Washington Historical Society will be able to provide some really neat things to see. Banquet costs are still being determined, so thank you for being patient with that. A core group from the local Snowmobile Clubs are working on the details of the day event. It was suggested to give a hail out to those who have Bolens Sprints and hope many bring those sleds to the event as well. A number of you have taken the challenge to get your sleds ready for Port Washington. To support that effort, we have evaluated the Parts List and lowered the cost on many items. Check out the updated list (click here) and let’s get those sleds ready! If you are looking for a project Diablo, I can help you with that too.Half the hotel block is full already! Wow – thank you to many who are committing early. If you book your rooms in May or tell me directly that you are coming to the banquet in May, I will get you and your guests their allotted “9” prize tickets.